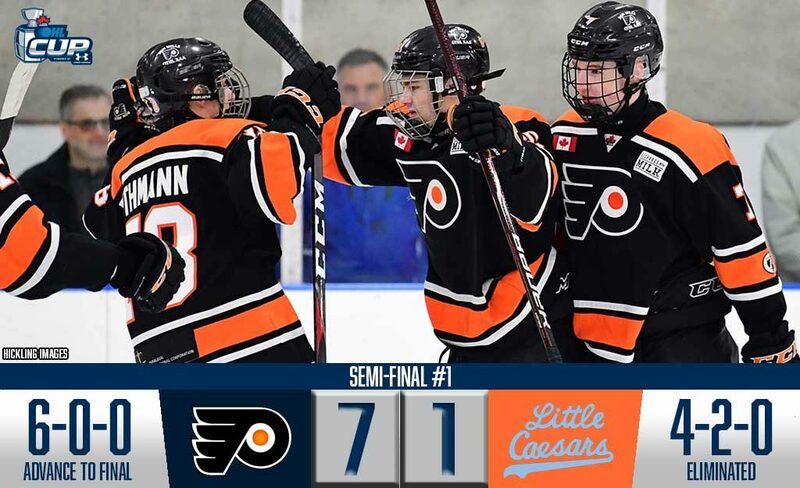 Exceptional status OHL Priority Selection prospect Shane Wright (5, 6, 7) gave fans a taste of what they can expect down the road, netting a hat-trick as the Don Mills Flyers punched their ticket to the OHL Cup Powered by Under Armour Championship Final. Don Mills overwhelmed the Detroit Little Caesars 7-1 as Wright was dialled in, joining teammate Brandt Clarke (2) with three points as the Flyers improved to 6-0. Wright climbed into the showcase scoring lead with a total of 15 points (7-8–15) over six games while other Don Mills goals came from Alex Christopoulos (4, 5), Francesco Arcuri (4) and Clarke (2). Detroit’s Billy Renfrew (2) ended Don Mills’ streak of shutout hockey at 158 minutes and 35 seconds, providing the Little Caesars with their lone goal as their showcase came to an end. Detroit wrapped things up as the first American team to reach the OHL Cup Powered by Under Armour semi-final since 2013, playing to 4-2 record. They were led offensively by captain Griffin Jurecki (4-6–10) while Saturday’s Player of the Game Jack O’Brien (2-6–8) trailed close behind. Zak Brice played all six of Detroit’s games, finishing with a 2.34 goals-against average, an .893 save percentage and two shutouts. The Flyers prepare for Monday’s OHL Cup Powered by Under Armour Championship Final set to take place at the Mattamy Athletic Centre, formerly known as Maple Leaf Gardens. The game can be seen live on Sportsnet Ontario when the puck drops at 7:00pm.